The new LaFerrari, presented in world preview at the Geneva Motor Show 2013, will be the first Maranello car to fit a hybrid-electric engine system called HY-KERS, to which Magneti Marelli will contribute its electric engines and various strategic component for management and control electronics. For the more extreme Ferrari ever, Magneti Marelli has drawn upon consolidated know-how and technological innovation from the racing world, adding to the HY-KERS developed by Maranello for LaFerrari. The HY-KERS fitted on the LaFerrari generates total power of 963 HP. It consists of a Ferrari V12 6.3-l aspirated combustion engine with 800 HP, running on gasoline, and of an electric part developed with Magneti Marelli, consisting of two electric engines capable of delivering together a peak power of 120 kW (about 163 HO). The HY-KERS system is able to push the car to record performances and simultaneously to reduce emissions by about 40%. 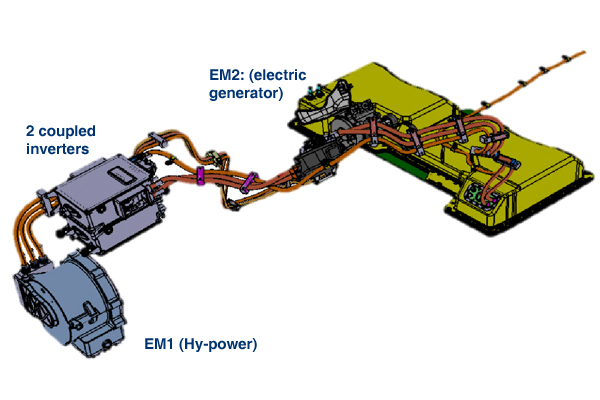 The two Magneti Marelli electric engines incorporated in the HY-KERS system are controlled by two associated inverters, which are compact in terms of weight and size. The first engine provides drive to the vehicle and recovers kinetic energy during braking, storing such energy in the lithium batteries and thus activating the power over-boost. The second engine, on the other hand, driven by the combustion engine, generates electricity used to keep the charge level of the lithium batteries constant, and also provides energy for standard vehicle systems (lighting, etc. ).